The housing development formerly named Capen Village has officially been renamed CoHo, according to Tufts Community Union (TCU) President Benya Kraus. CoHo is intended to serve as themed housing for juniors and seniors, Kraus said. The name change comes about because of Medford zoning rules, which include specific requirements for the use of the term “village,” Jamie Neikrie, a senior and the administration and policy chair on TCU Senate said. “At first people were calling it Capen Village, and village is [a] very specific term in terms of development to Medford. There’s certain zoning rules you have to meet to be able to call it a village,” Neikrie said. 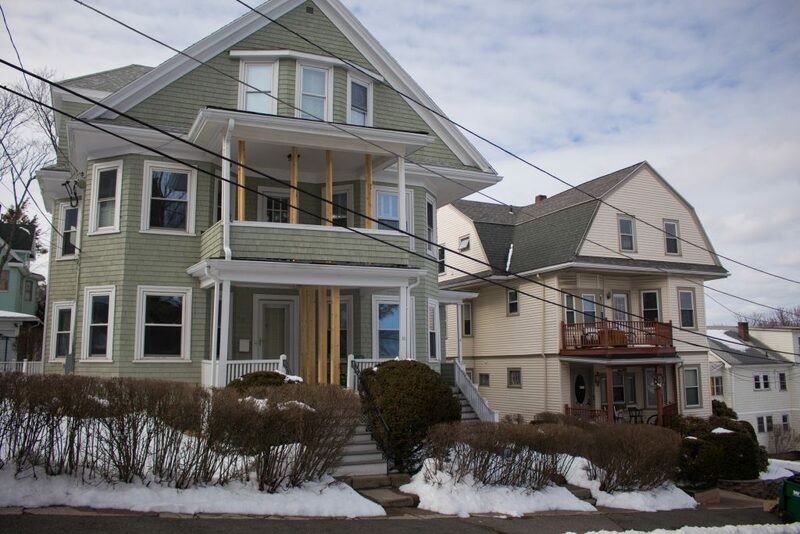 Kraus, a senior, posted a survey regarding these wood frame houses in Tufts class Facebook pages on March 26, encouraging them to actively participate in the name selection process. Results are expected to be released around May 3, Kraus said. Students in the Urban and Environmental Planning and Policy (UEP) Field Project course generated the survey, which included specific questions relating to potential starting names and activity space uses, according to Kraus. The UEP course has also had the active involvement of graduate students Kaitlin Mills, Shabnam Bista and Anna Sangree. “The questions were like ‘What type of programming? What type of themes? What would you like the theme selection and the student selection process to be? What kind of physical amenities would you like to enhance community-building in that space?’” Kraus stated. Shane Woolley, a junior, expressed that the housing will benefit the Tufts student body as a whole, offering spaces for all. “It seems like the open ‘quad’ area between the houses on Winthrop and Bellevue has some serious potential to serve as a multi-purpose recreational space for the whole Tufts community,” Woolley said. Neikrie said it is positive that some of the spaces, even within the houses, will be reservable. “The idea behind these houses is that they will be themed, and they will go to programming for the entire student body … Beyond [the open spaces] there are going to be [a few] rooms attached to the houses where they are thinking that these could be spaces that potentially could be reserved in the same way that any of the shared spaces on campus can be reserved,” Neikrie said. Some ideas proposed in the UEP survey included a study space, a movie room, and a game room. The students in the UEP Field Project course have also been actively involved in connecting students and administrators. Kraus described the current role of the UEP Field Project students as consultants for the Operations Division. This includes making and recommending site plans, and speaking with administrators in the development process. University Advancement selected the four names on the survey, but they also wanted to get student feedback, Kraus explained. By creating undergraduate focus groups, the UEP Field Project students were able to draw up a list of names that many students supported. One other possibility would be to dedicate the building to a donor to garner further funding for the houses, Kraus noted. According to Kraus, University Advancement made the final decision to rename the project CoHo, but the Project Sponsor Group, chaired by Executive Vice President Patricia Campbell, also approved the name. The survey was also intended to gauge community interest in the housing. The feedback was greater than expected and has been very positive, Kraus explained, with around 750 responses in a week, surpassing their goal of 500 responses. As a result they pulled the survey early so they could begin to analyze the data and read student feedback, Kraus added. “The preliminary analysis right now of the survey results is that a lot of people are really excited about this. They’re really excited about the potential of it being themed housing. That was a pretty overwhelming response that we got back,” Kraus said. She also described the involvement of students based on the initial survey results. “The amount of write-ins we got in [for names] also really showed that people were really engaging with the survey, and it was really helpful for our group to think what kind of physical and programming design students want to have included,” Kraus said. Kraus stated that while they’re aiding the housing development, they keep in mind that it is also important to coexist with Medford residents. “We wanted a name that would explain the character and intention behind living in this place as well as being respectful about being part of the Medford community, not imposing a Tufts Jumbo identity,” Kraus said. Neikrie encouraged students to participate in the development process as much as possible. “[It’s a place students should] want to live in and be a part of. It’s a unique opportunity to help shape what those spaces are going to look like. I would encourage students to get involved in whatever way they can so we can make these spaces welcoming to the entire Tufts community,” Neikrie said. Woolley described the housing as a chance for Tufts to change its focus from reactive to proactive thinking. He described Tufts’ history of commissioning plans to anticipate new facilities and buildings, like the William Rawn plan drawn up in 2006. “Right now, Tufts is responding to the residential and social demands of its student body reactively … The Operations Division needs to make a plan for housing the university’s students in an inclusive, accessible, and environmentally sustainable way, and stick with it. And the more student involvement in that process, the better. We can use this moment as an opportunity to have tough but necessary conversations about what kind of school we want to be, and then, hopefully, build that vision,” Woolley said.